Welcome to the Stadium Runners Newsletter. We hope to keep you informed about what has happened and what will be happening in the wonderful world of Stadium Runners. Please contact me if it is still being marked as spam for you. Simon just edged out Jamie on the day, and so picked up that last vital 50 points to take the top spot in the Men's Grand Prix. Super performances by all our runners. Kudos to Ashleigh & Simon for cleaning up on the silverware! Well done to everyone else who took part. If you didn't, then why not think about it next year? The new race schedule starts in April. Very well done to Leo & Emily, and to all the other runners who took part. Those who haven't collected their cross country race numbers need to come and see Ashleigh please to collect them. Everyone needs to keep the number they have been given for the duration of the season and wear that same one for every race! The next race is at Queensbury on 2nd December at 10am. Please note that it is a different course in a different location from the Queensbury race in the last couple of years! It is a 5 mile route at Ogden Reservoir. There is plenty of parking at the Causeway foot pub. Please park in the field through the car park not the pub car park or the reservoir car park. This is also the meeting point after the race that is selling chip butties, hot drinks and booze. The postcode is HX2 8XX. Its nearly 1000ft of climbing throughout, and we are promised a muddy course. Sounds splendid! Sunday 11th November brought to a conclusion Stadium Runners first season in the Yorkshire Vets League. For those wondering you become a vet at the tender age of 35! 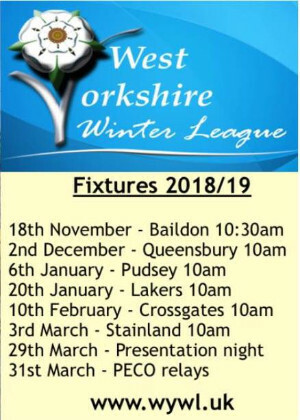 If you are expecting this to be a series of races run at a sedate leisurely pace then you’d be wrong, think West Yorkshire Winter League (WYWL) for slightly older runners. The beauty of this league is that it’s run during the summer months and on the whole the conditions are dry and warm. Each race is run from premises (usually a sports facility) with food and drink at the end along with a prize giving. You run with a series race number with the addition of your age category on your back which mean that race tactics can kick in as you know who to chase. The league is split into a Grand Prix and a Championship. The Championship races are part of other established races, whereas the Grand Prix races are only for members of the league and are off road. Each GP race cost £5.00 to enter. During this season 11 Stadium Runners took part, 4 ladies and 7 men. Anouska Higo, Helen Clegg, Claire Smith & Sandra Emerson. Ian Sutcliffe (4th Vet 45), Russell Dyson (4th Vet 70), Mick Lunn, Ian Rogers, Mark Davies, John Cottam & John Taylor. Stadium Runners have had a good first season in the league, so if you fancy a bit of summer time off road running then this is the league for you. The first GP race was held in Honley in April. This race started in near perfect conditions with plenty of hills, woods and fields with a long downhill finish, unfortunately this race ended in heavy rain, but there was plenty of cake at the finish. Race 2 – Roundhay Park saw the highest entry in the series history and after a short delay set off on a fast downhill start followed by excellent running, through the park on grass, tracks, woods and paths. Race 3 – Kirkstall Abbey was pretty much flat, starting with a mad dash around the abbey which spread the field before heading off on narrower tracks. Again this was a very fast course with long flat sections, one of these being alongside a river where at one point we were racing a 6 man rowing boat! Race 4 – Lythe Nr Whitby, held in the grounds of Mulgrave Castle. The route was on undulating forest tracks and ended with a killer uphill finish, causing many runners to walk over the finish line! Race 5 – South Leeds, this route was very similar to the WYWL course round Middleton Woods. Race 6 – Bingley, a short walk to the start saw the field set off on a dash down the canal before heading off on a hilly course through parks and woodlands and after a considerable climb up onto the moors, finished back down on the canal. Race 7 – Halifax, based at Spring Hall, it was a fast flat course using the canal towpaths & river paths. Race 8 – West Vale, this was run on the old WYWL cross country course, which included the terrible rocky descent, which luckily was dry. Race 9 – Spenborough, following a 2 minutes silence for remembrance day, the race set off in the pouring rain round the running track; taking in fields, tracks and the greenway before finishing back on the track. Written by Helen & Ian. Steve Taylor accomplished the amaizing feat of running 3 marathons in 6 days. Joe Baker & Ashleigh Greenwood also both did the Northern Jumble. Joe did the Ultra option (33m) and was the fastest runner in 4:38, but sadly relegated to 5th place due to an admin mix-up. Ashleigh did the marathon and was 1st Lady in 3:37! The UK Athletics clubrun programme supports coaches, leaders & runners through a series of practical sessions.The sessions consist of 3 visits over 3 months, each lasting 90 mins to 2 hours, and will be delivered by Stuart Hale, an experienced coach. The sessions will focus on technique, race preparation and injury prevention. They will include an endurance specific warm up & cool down, and an informal discussion. The last of our 3 sessions is at the Leeds Road Track on Mon 3rd Dec.
A booking sheet for the December session is on the notice board at the club now, sign up on there, or email us to book a place. Awards Night tickets are now on sale! This year it will be at held in the Waterloo Suite at Lockwood Park on Saturday 16th February, 7pm until late. The evening will include the awards ceremony, DJ, food and launch of the 2019/20 Race Calendar (we’ll release races likely to fill up at our Christmas training run on 20th Dec). £15 per person and plus 1s are welcome. Tickets on sale until the end of January. It would be great to see you all there! That's all for now. Thanks to Helen & Ian for their contribution. If you have a piece that you want including in a future newsletter, or you have any questions on anything in this edition, then please contact me. 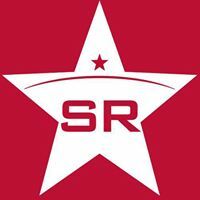 Welcome to the relaunch of the Stadium Runners newsletter. We hope to keep you informed about what has happened and what will be happening in the wonderful world of Stadium Runners. Hot on the heels of the London Marathon this newsletter wont take 2hrs and eight minutes to read! Contributions are really appreciated: If you run with Stadium Runners and have an experience or observation you want to write about, please send it in using the contact form. Your entry should have something to do with running! It could be a race report, stuff about training or nutrition, a book review etc.